I'm not one of the many children whose parents sat them down to watch a movie about a woman who gets carried away by her umbrella (sorry, that is my one and only frame of reference to the 1964 film, Mary Poppins). So my interest going in to SAVING MR. BANKS, a movie essentially about how the classic film came to be, was admittedly very low. Thankfully the movie doesn't just show the unusually quirky--and laborious--challenge it was to create one of the most adored movies of all time. While it is entertaining to watch Emma Thompson, as P.L. Travers, the famed author behind the books by which Poppins is inspired, be fiercely protective of her cherished character in an endless series of biting quips to everyone from the songwriters, the Disney chauffeur and even Walt Disney himself (Tom Hanks), I was more interested in her backstory. Director John Lee Hancock (The Blind Side), with the help of writers Kelly Marcel and Sue Smith, simultaneously peels back the layers of Travers' prickly personality to reveal a childhood filled with yearning and boosted by illusion. Told in flashbacks, we see Travers as a young girl (Annie Rose Buckley) living a very modest life in Australia in the early 1900s. She was a daddy's girl, never leaving his side even when his trails often led her to witness him in a drunken stupor. But he was her hero, and he made an impact in her life and--most importantly--on her famous heroine. While I don't have a connection to Travers or her books, I do like the way Hancock gives us non-Poppins folk something to appreciate about the film. She is humanized in a way that I think her biggest fans will be most affected. Thompson's portrayal is as much deliriously rigid as it is touching and entertaining. It essentially unmasks someone who was tough cookie to crack. But, unlike Meryl Streep's brilliant makeup-free scene in The Devil's Wears Prada where we're offered a teensy bit of humanity in an otherwise intransigent character, Travers' unveiling here is much more gradual--but also kinda corny by the ending. In other words, it follows the Disney modus operandi of ultimately exalting even the most unlikable characters in order to satisfy their traditional family audiences. She essentially blossoms into an amiable human as she is strong-armed into the world of endless joy and Disneydom, which helps her realizes her past hangups. That last part is super cheesy, but the movie somehow makes it believable because it's Walt Disney and how can you possibly stay miserable in Disneyland, right? Even if you think the man himself is trying to change your work (he wasn't, really). I don't know why, but I couldn't stop thinking of Bluto (you know, from Popeye?) while watching Hanks onscreen. He's like an aggressively nice, though smoothly persuasive, version of the animated villain who clearly has something to gain from this partnership with Travers, but it has little to do with money. He does help bring out the truth in Travers. It's oddly one of the few Hanks performances that I'd label simply as "serviceable," not great but not bad--very middle of the road. As the titan of animation, Hanks is more of a mascot if anything. Though, he does serve as the referee between Travers and his trusted songwriters Robert and Richard Sherman (B.J. Novak and Jason Schwartzman) in a few hilarious scenes. But, once again, it all comes back to how the film delves into the real Travers in the more poignant flashback scenes. 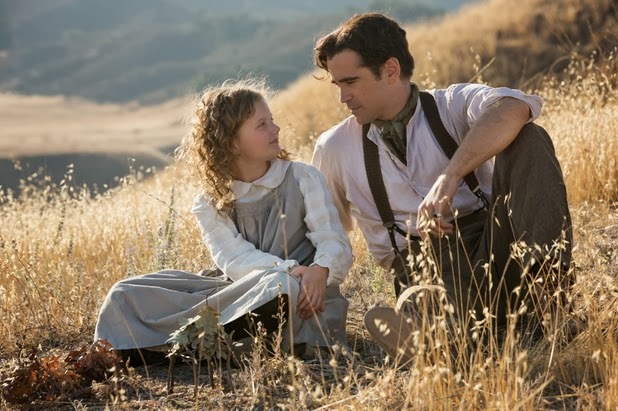 Colin Farrell is wonderful as her dad, Travers Goff, proving once again that his real niche lies in playing broken, wandering supporting characters rather than flashy Hollywood lead roles. He manages to look both damaged and hopeful at the same time. His wife and Travers' mother, played by Ruth Wilson, also shines as a forlorn woman who young Travers (affectionately called "Ginty" by her dad) seems to see more as someone to coddle than as a maternal figure. 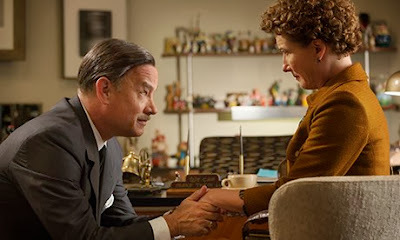 SAVING MR. BANKS is sweet and loving and full of transformative hope. You can tell Thompson is having fun with the role as she snaps back at everyone who she feels is trying to change her precious Poppins (the idea of having animated penguins in the film is especially distressing to her). Essentially it comes down to taking the themes of her story rather than the more literal analysis--a compromise she was very unwilling to make. But, of course, Disney's charm could cut through any icy demeanor and ultimately wins out. But I can't say SAVING MR. BANKS resonated with me as it undoubtedly will with others. I wish it had been more about Travers' backstory, which Hancock does beautifully--then the making of Poppins. The film focuses on appealing to those who've seen and love Mary Poppins but, in doing so, slightly alienates the rest of us who haven't (though I think the general assumption is that everyone has seen Poppins so we should all be on the same page--but we're not). It's lovely and magical even if it is a bit corny at times in its endless attempt to Mickey Mouse-ify the most averse viewer (or, ahem, someone who hasn't seen Poppins). The film is elegantly shot as it recreates old school Disneyland vis à vis Hollywood, a throwback to vintage glamour in a more demure sense. But even with a delightful cast and its nostalgic glaze, SAVING MR. BANKS left me a bit cold, like a young child looking into the window of a grand party to which I wasn't invited. 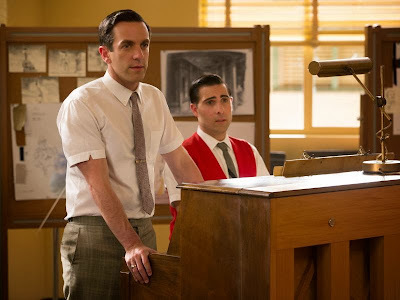 SAVING MR. BANKS is in limited theaters this Friday (December 13th), and opens nationwide on December 20th. I'm really glad to hear there's something for those who have no attachment to Mary Poppins. Like you, I've never watched the entire movie and it's never been high of my list of things to do. A good movie, buoyed by good performances from Emma Thompson, Tom Hanks and, almost as an afterthought, an especially affecting Colin Farrell.